Fireworks are done and we are definitely on the home-run to Christmas. Must be time to move concertedly into seasonal cooking mode. Ye ha!! Way back in October (which is even too early for me! 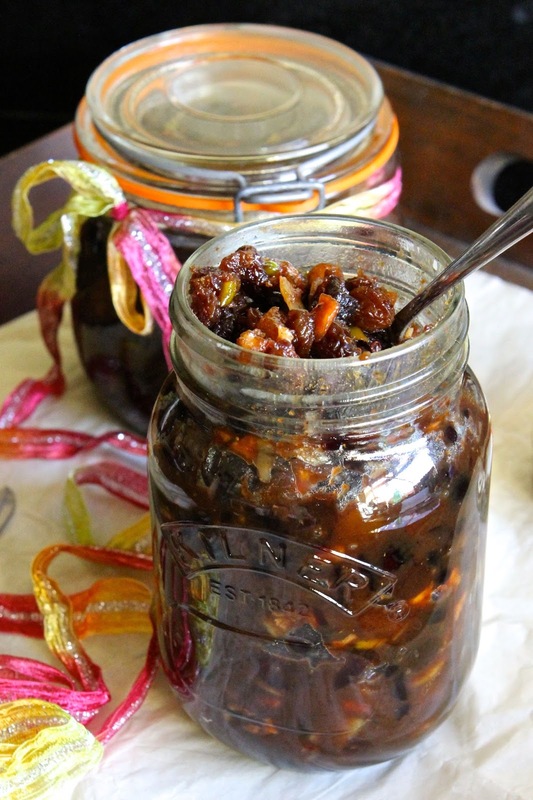 ), Laura over at I'd Much Rather Bake Than.... made a rather tasty looking Whisky Christmas Mincemeat. What I loved about it was that it was made without suet. Like Laura, I am not a big suet fan. However Laura was clever enough to spot a non-suet Mary Berry recipe and this inspired her to make her own version........ which in turn has inspired me to make mine! Isn't the internet amazing? It creates waves of inspiration and ripples of adaptations of recipes from one site to another, each a little different from the last, so that creativity is allowed to flourish and the experience of eating becomes more varied and exciting each and every day. 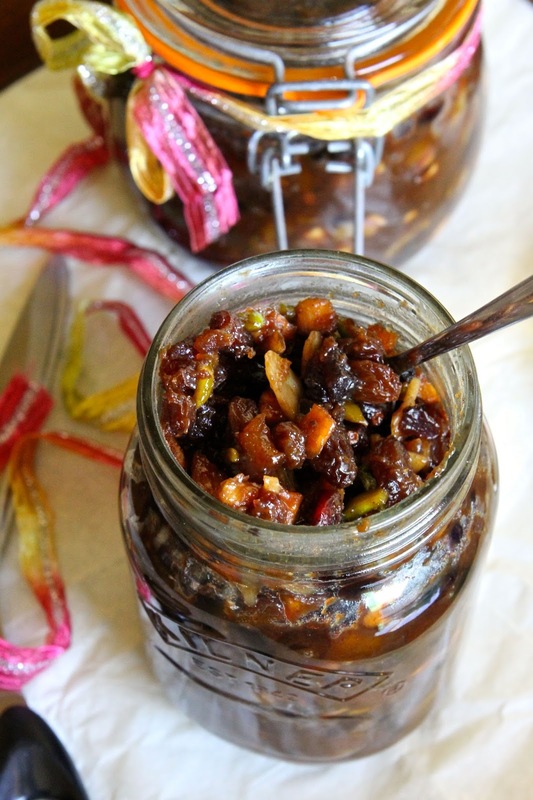 Mincemeat is one of those preserves which sits on a wide love-hate spectrum, depending on what is in it and personal preference. 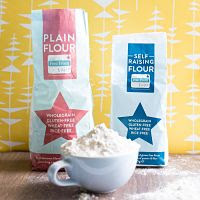 But it is also incredibly forgiving....... allowing you to make it to your own specifications with all your best-loved ingredients. 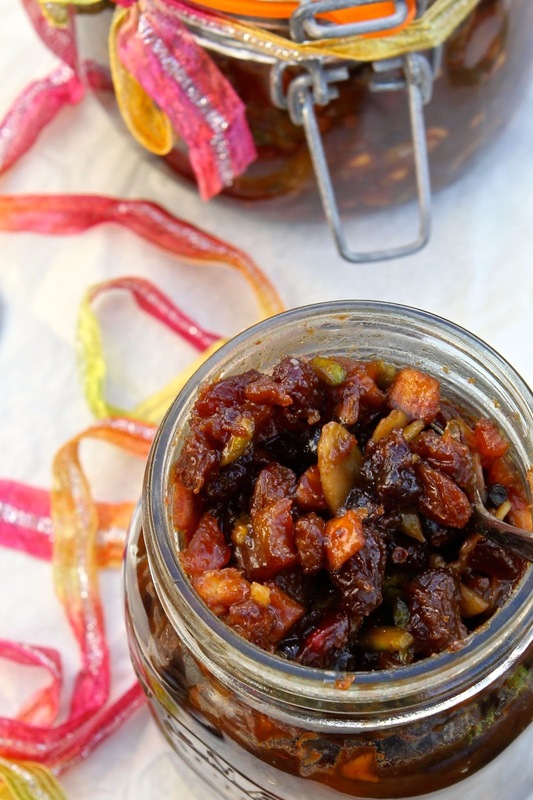 This version (for me) is the nicest mincemeat I have ever had........ and yes..... it is stuffed full of all my favourite stuff..... made to be extra fruity, incredibly colourful, spiced to celebrate the flavours of Christmas and laced (heavily!) with alcohol to give a hefty, warming, seasonal glow. Not being over-keen on an excessive weighting of traditional mincemeat fruit (sultanas, raisins and currants), I limited their amount (which included removing the currants altogether), instead going for a colourful, array of rich orange apricots, dark red morello glace cherries, Christmas red cranberries and tiny dried blueberries. The dried blueberries were an unexpected, but amazing addition. Spotting them on the shelf in the supermarket when I went to buy the other fruit, these tiny little dots of blueberry goodness from Crazy Jack are packed full of flavour and definitely add an extra dimension. I've gone for a deep caramel sugar hit in here too...... dark brown molasses sugar combined with natural, raw coconut sugar, which add an elevated level of grownup sweetness to complement the mix........ All topped off and spiced up with warming winter cinnamon, ginger and orange. All in all...... totally delicious! I am really really looking forward to mince pies this year......... and I have several other treats up my mincemeaty sleeve too! Cook Blog Share, with Lucy at Supergolden Bakes. Cooking with Herbs with Karen at Lavender & Lovage - who for November and December is inviting recipes celebrating sugar & spice. Sterilise your jars whilst you make the mincemeat as follows : Wash your jam jars in warm soapy water and rinse thoroughly. Place on a baking tray and into a cold oven. Turn the oven on and set to 150 C/300 F/Gas 2. Once the oven has come to temperature, leave for a further 15 to 20 minutes (or until you have finished making the mincemeat if longer). In a bowl, mix the dried apple cubes with the apple juice and leave to soak whilst you weigh the rest of the ingredients. Put all of the other ingredients (except the Calvados) in a large saucepan and lastly add the soaked apple. Stir all the ingredients together over a low heat until the butter has melted and the sugars have dissolved. Gently cook the mixture for about 10 minutes, stirring frequently and then turn off the heat and set aside to cool slightly. Stir the alcohol into the mincemeat whilst still hot (but not boiling). 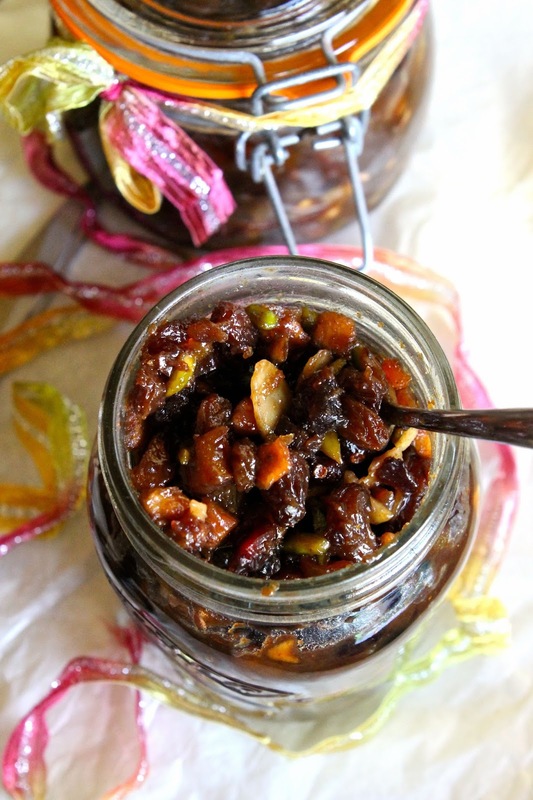 Remove the jars from the oven and pack the mincemeat into them, sealing the jars immediately with the lids. Leave to cool and store in a dark cool place for at least a month to mature fully. I'm not a huge fan of mincemeat but this sounds like a lovely alternative. I'll have to start planning my Christmas bakes soon. I'm not a huge fan of 'traditional' mincemeat either Ros. But this stuff is nothing like it!!!! Thank you so much for mentoring me! Your adaptations sound delicious. I wish I had thought of blueberries. I love the ribbon you've used in your pictures too. You're welcome Laura. Thanks for the inspiration! I think the ribbon was from a present that someone gave me....... pretty though! I've stuck with my very traditional mincemeat this year as my husband is a big mince pie fan and wouldn't be happy if I messed around with it, but I think your version sounds amazing. I'm very tempted to make a sneaky extra batch of this too!! Thanks Charlotte. I reckon it is worth making a sneaky batch and then 'accidentally' slipping an impostor pie onto his plate...... If he doesn't 'get it', you can apologise for the mix up and enjoy them all yourself! oooh, it's been ages since i've made my own mincemeat... I love the addition of calvados, very sophisticated!... time to get out those jars! All your bakings are fabulous especially the last ones you made! I love them all. 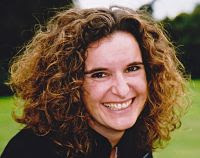 Thanks Alida. I hope you give it a try..... I'm generally not over-keen on the traditional recipes for mincemeat...... this one is so much nicer. Oh no Jen..... That's not good..... you must give it another go! Its still a bit early for me to be thinking about Christmas, still take my hats off to you for being organised and making what seems to be a very delicious filling for mince pies, intrigued by the addition of pistachio nuts, very different. Too early? Yes probably! But mincemeat likes time to mature, so it seemed like a good idea to get some made now. That looks wonderful and so bright and festive. I've not made my own in years, but you've got me wanting to now. I always love a bit stirred into porridge for a winter treat. Thanks Katie. Definitely get those jars out! Love the idea of stirring into porridge...... I'm going to try that this weekend!!! 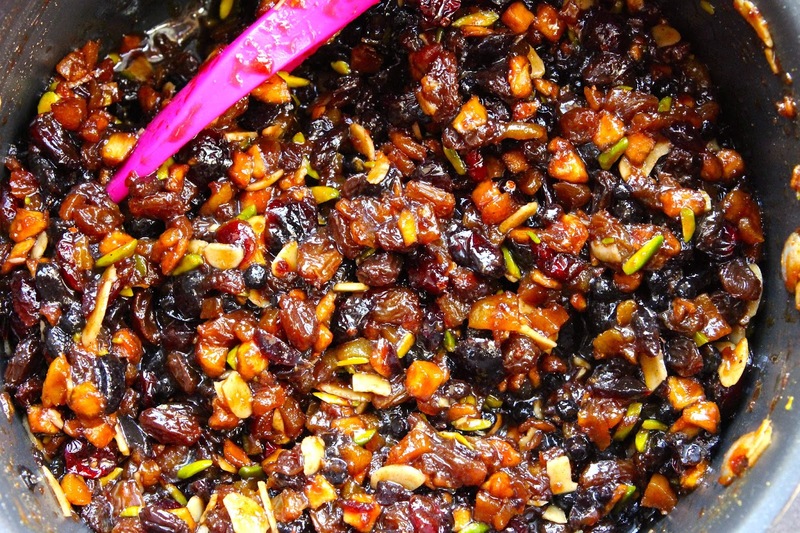 Lovely mincemeat – we are enjoying an early Christmas this year what with creating blogposts and such but mincemeat benefits from maturing so it's good to make it a bit early anyway. One gorgeous thing you can make with it is brownies... 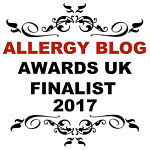 Thanks for linking to #CookBlogShare! Ooooooohhhh yes..... Mincemeat Brownies........ they sound amazing! Thanks Lucy! Thank you. I hate candied peel too Kirsten (and suet!). Definitely make your own..... it is so easy!